There are two types of umbrellas, right? The ones that look good, with classy rustic design, sleek fabric and elegant colours. And then there are functional umbrellas; the ones that stay intact in the howling wind and don’t leave you with wet hair, face, arms, legs and handbag. Here’s a little secret for you. It's actually possible to have the best of both worlds: with Clifton! 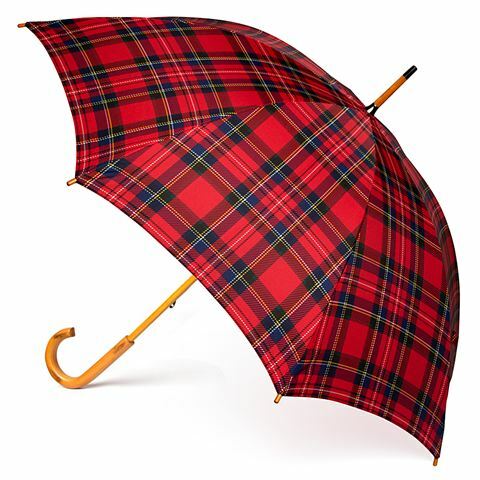 This Australian designed Ladies Umbrella looks charming, with a bright wooden handle and sleek slim-line polyester fabric. There is a button on the velcro strap to give your umbrella a unique, charismatic appeal - so lady-like! But most importantly, this is an umbrella that won’t let you down. The wood is lightweight, making it easy to carry around with you. And the huge diameter keeps you protected against the cruellest of downpours – sideways rain! If you’re looking for the umbrella that does it all…you’ve got the secret! Lightweight wood and 8 fibreglass ribs. Velcro strap includes a decorative button. Pattern: Red Royal Stewart Tartan.